PMBC’s client KeySmart, was featured in The Gadgeteer. There are only 11 shopping days until Fother’s day on Sunday, June 17th. You haven’t forgotten dear old dad, have you? If you haven’t even begun shopping, I can imagine that knowing that the big day is so close is stressing you out. But there is still plenty of time to find the perfect gift and we have a few ideas to help you out. Does your busy dad have problems keeping all of his keys and small EDC tools organized? 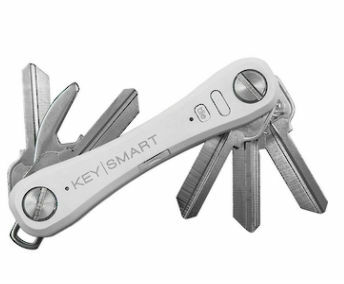 The KeySmart Pro Handyman bundle is a ‘jack of all trades’ for keys. It keeps them in a small jangle free bundle that has a built-in Tile Bluetooth finder module. That means that your dad will never leave home without his keys or accidentally leave them behind at a restaurant, etc. The Keysmart not only organizes your keys, but the special Handyman bundle also has a knife, magconnect swivel connector, and a screwdriver. What’s even better is that if you buy one, you get another one for free!